School’s Out, Cumbria’s In, Thanks to MyCumbria Discount Card! As excitement builds among thousands of local children ahead of their annual six-week summer break, families across Cumbria and parts of North Lancashire are being invited to make savings on unforgettable days out by picking up a ‘MyCumbria’ residents card, which offers discounts at a wide range of local attractions. Here in the UK’s capital of adventure, a fun day out is never far away; and the same can be said about our special offers to keep your youngsters entertained. From Segway treks to waterfall climbing adventures and paintballing, the UK’s capital of adventure will again be #theplacetobe before youngsters go back to school in September. “There’s nothing quite like the sight of a family enjoying what Cumbria has to offer”, says Sam Tollerson, who oversees the card scheme at Cumbria Tourism. “Not only do we offer great adventures and activities, but it also means Mums and Dads have the chance to sit back and relax while their children explore and have fun. Special offers for holders of the ‘MyCumbria’ card include a 20% saving for a family of four at Brockhole’s Treetop Trek, discounts of between 10% and 15% on food at many of the county’s pubs and restaurants – including a 2 for 1 offer for afternoon tea at Broadoaks Country House in Windermere; and buy one get one free ticket offers at participating cinemas in Keswick, Bowness-on-Windermere, Whitehaven, Workington and Ulverston. Entry discounts to attractions also include 50% off at the Lakeside and Haverthwaite Railway. “We hope families will enjoy visiting their favourite attractions with the ‘MyCumbria’ card, but also explore places they may not have been before”, Sam said. “Not only do we have this internationally recognised national park, but more than 100 miles of glorious coastline to explore too; where offers include things like a discount at the famous Ravenglass and Eskdale Railway for example. 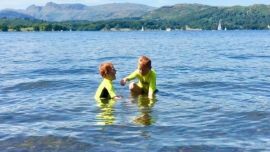 “We’ve always said Cumbria is both the perfect destination for a relaxing day out while being a great adventure hub at the same time, so whatever your family’s age-range, we’ve got it all covered here! “’Mum, Dad, I’m bored!’ are the words parents dread to hear at this time of year, but we’re well-placed to keep your little ones entertained throughout July, August and September”, Sam added. Hundreds of offers are listed at mycumbriacard.co.uk, where everything is broken down by category, including ‘Things to Do’, ‘Shopping’ and ‘Food & Drink’. Residents who live in a CA or LA postcode are eligible to join Cumbria Tourism’s ‘MyCumbria’ discount card scheme which offers discounts at hundreds of participating businesses and attractions across the county. Full details are online at www.mycumbriacard.co.uk.